Accordions are helpful when you would like to condense the information on a page and let your visitors select what they want see. For example: FAQs, long calendar lists, directions and more. First, create a new page, or navigate to an existing page. In the Content section, select the Accordions radio button. Expand the Content > Accordion Content Type. Enter the text that you always want visible in the Accordion Title field (required). If necessary, enter a subheading in the Heading field. This is the accordion text. 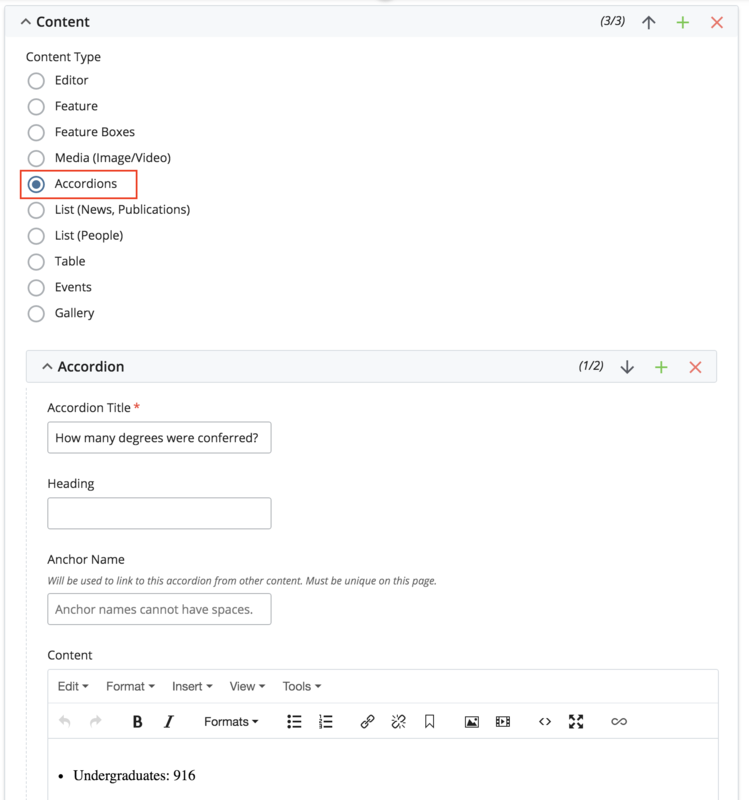 Creating an anchor to a specific accordion field is helpful when you'd like to link to it from another point on your page or on a different page. In the CMS, select the specific accordion to which you would like to link. In the Anchor Name field, type in a name that is both descriptive and easy to remember. Anchor names should be short with no spaces and consist of lowercase letters, numbers and/or dashes. You can link directly to any accordion with an anchor link once the page has been published. Refer to Insert Links and Anchors to do this. In the light blue bar to the right of the word Accordion (not in the blue bar which says Content), click on the green plus icon (+) to add a new accordion field. If you have created more than one accordion field and want to delete one, in the blue bar to the right of the word Accordion (not the blue bar with says Content), click on the red (x) icon to delete the accordion field that you do not want. If you have created more than one accordion field, in the blue bar to the right of the word Accordion (not the blue bar which says Content), click on the up/down arrows change the order of the accordion fields.